Lawncare is a snap with Weed Eater's new 2-in-1 tool family. 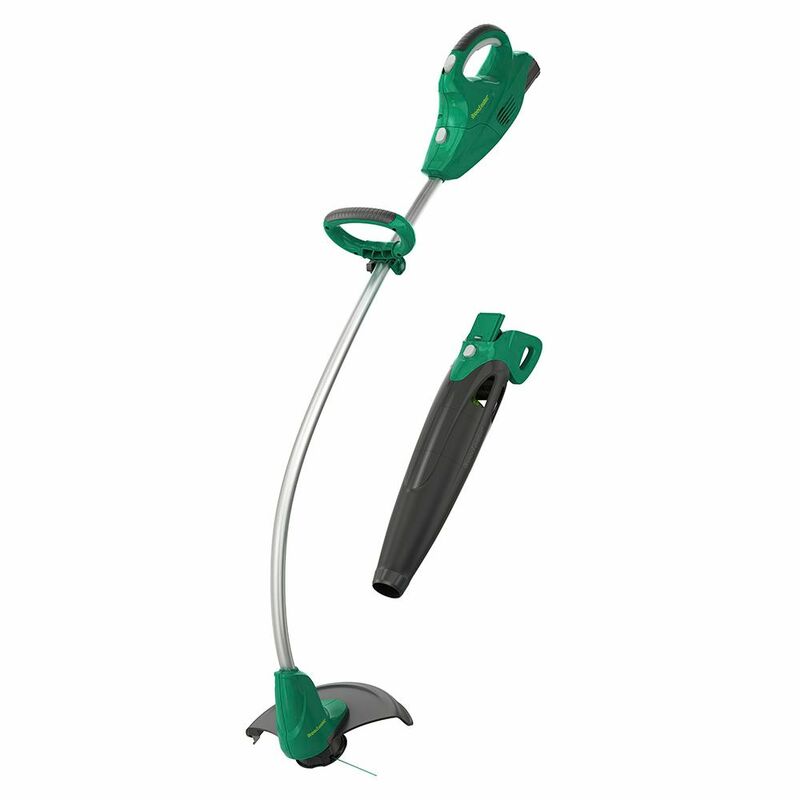 It features one interchangeable 20-volt battery-powered powerhead that runs multiple tools (string trimmer and leaf blower included). Just pull one attachment out and snap another in, to easily take on multiple lawncare tasks quickly and efficiently. With a hassle-free 20-volt, 2.5 Ah battery, it powers up instantly with the simple press of a button. No pull cords, power cords, gas, oil, or fumes. Each interchangeable tool is compact, super-lightweight, easy to start, and easy to use. Our blower and string trimmer combination pack includes the T100i string trimmer, featuring a 12-inch cutting path and single-line trimmer head that automatically feeds cutting line when needed; and our B230i leaf blower, featuring 80 MPH air speed and 250 CFM of blowing force. This interchangeable combination puts two hassle-free tools in your hands, with plenty of power to trim grass and blow away grass, leaves, and other debris. No pull cords, power cords, gas, oil, or fumes. Tired of bumping and stooping? This lightweight, adjustable Balck & Decker trimmer/edger gives you flexibility and comfort, with Automatic Feed Spool and easy conversion between trimming and edging. Effortlessly trim overgrowth and precision-edge sidewalks for a well-groomed yard. Get a groomed look with this SMARTECH combo of our LCC520BT BLACK+DECKER 20V SMARTECH Combo Kit String Trimmer and Sweeper. This EASYFEED trimmer/edger and POWERBOOST sweeper. Save time with push-button line advance and convert in seconds to edging mode. The blower powers through tough debris. Manage the SMARTECH battery remotely via app and use it as a portable charger to charge your mobile devices for ultimate convenience. 20V Cordless Multi-Tool String Trimmer and Leaf Blower, BT201i Lawncare is a snap with Weed Eater's new 2-in-1 tool family. It features one interchangeable 20-volt battery-powered powerhead that runs multiple tools (string trimmer and leaf blower included). Just pull one attachment out and snap another in, to easily take on multiple lawncare tasks quickly and efficiently. With a hassle-free 20-volt, 2.5 Ah battery, it powers up instantly with the simple press of a button. No pull cords, power cords, gas, oil, or fumes. Each interchangeable tool is compact, super-lightweight, easy to start, and easy to use. Our blower and string trimmer combination pack includes the T100i string trimmer, featuring a 12-inch cutting path and single-line trimmer head that automatically feeds cutting line when needed; and our B230i leaf blower, featuring 80 MPH air speed and 250 CFM of blowing force. This interchangeable combination puts two hassle-free tools in your hands, with plenty of power to trim grass and blow away grass, leaves, and other debris. 20V Cordless Multi-Tool String Trimmer and Leaf Blower, BT201i is rated 4.6 out of 5 by 9.